Autumn brings many reasons to celebrate. 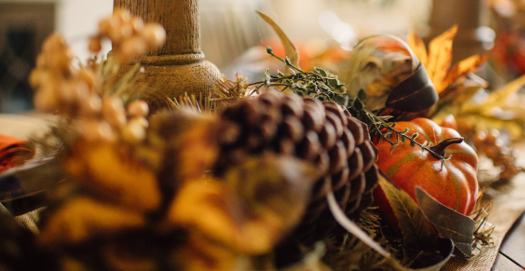 Whether it’s for a special occasion or holidays like Halloween and Thanksgiving, any gathering with family and friends calls for beautiful fall season decorations to create a warm and welcoming ambience. 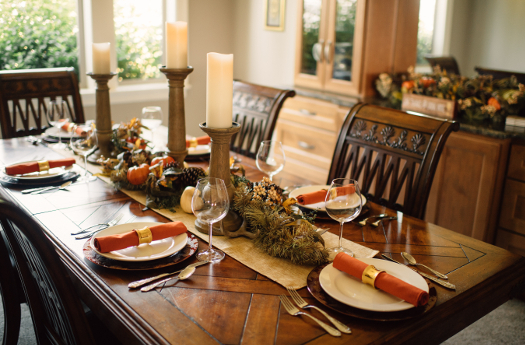 Today’s post has best-selling author Debbie Macomber sharing her ideas on fall table settings, inspired by her book, Debbie Macomber’s Table: Sharing the Joy of Cooking with Family and Friends. A labor of love, the book features 100 original recipes and inspiring ideas for holiday entertaining. It’s one of my favorite times of the year, autumn. While I love the holiday season, there is something really special about this time of year because the cool breeze, crisp leaves, and change in seasons bring out the joy we find in simply being together. Even though our children have matured and married, we still make time as a family, gathering to delight in each other’s company and enjoy everyone’s favorite foods. And it’s the table itself that sets the tone for the whole experience, creating moments to be savored. 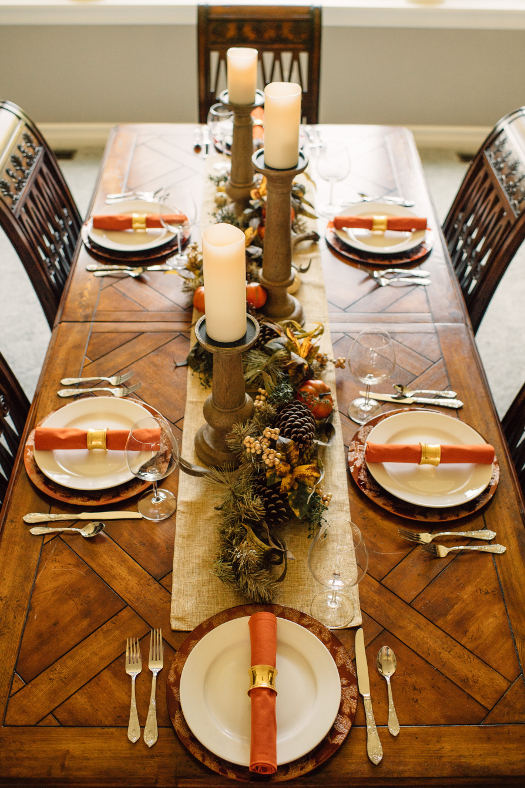 Believe it or not, the tablescape plays a big role in all of this. But designing a style you’ll love that evokes grace and gratitude shouldn’t be harder than cooking the meal! 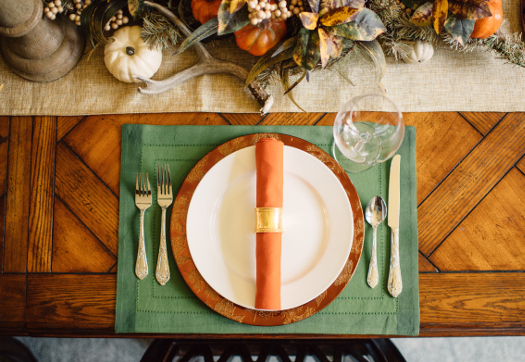 I just adore a warm autumn palette that really invites guests in when they sit down at the table. And there is something to be said for the natural beauty of these pieces from Balsam Hill. Crafted by hand and featuring an array of orange pumpkins, white berries, and greenery, this swag makes the perfect fall centerpiece. Embracing the elegance of harvest season, it’s embellished with pinecones and a variety of leaf accents. And the best part is that it can also double as a lovely fall decoration for your door. Lastly, a soft glow makes the perfect finishing touch to the room. These chunky wooden pillars raise up the flameless candles to a comfortable height for conversation while casting just the right light. I also used metallic charger plates with a linen runner to round out the natural elements of the décor. 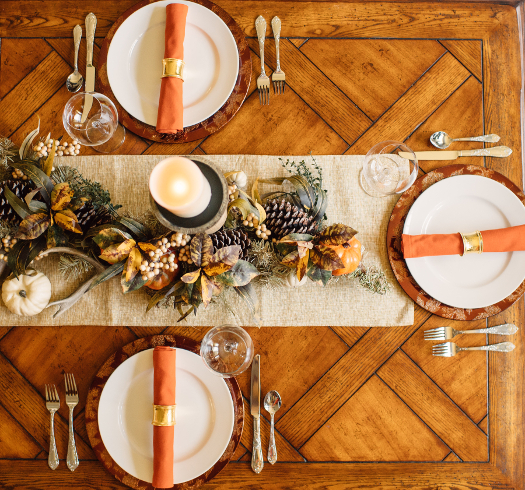 This table layers the simplest of elements and textures for a look that’s naturally beautiful all season long. 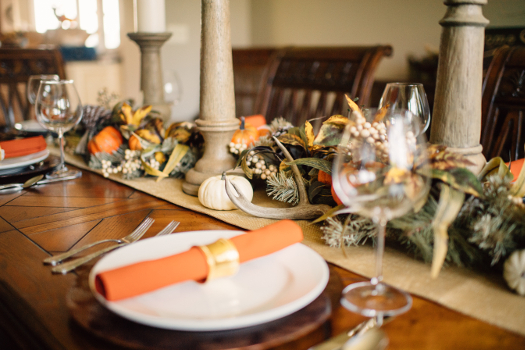 Do you have a favorite fall table centerpiece? Share with us your tablescape ideas in the comments!